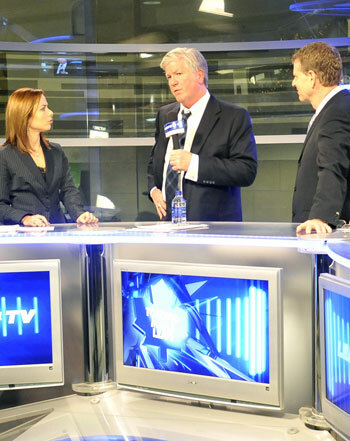 Richard Peddie, President and Chief Executive Officer of Maple Leaf Sports & Entertainment Ltd., announced Saturday that Brian Burke has been named the new President and General Manager of the Toronto Maple Leafs. In keeping with club policy, terms of the contract were not disclosed. “I’m extremely pleased to announce the appointment of Brian Burke as president and general manager of the Leafs,” said Peddie. “We all agreed that our hockey team needed an experienced, established decision-maker who will make the Leafs a winner. We know Brian possesses the necessary qualities to meet the challenges ahead for our organization and in this market. The 53-year-old Burke becomes the 13th General Manager in Toronto Maple Leafs history and brings over 20 years of National Hockey League experience in various roles to the franchise. Most recently, Burke served as Executive Vice President and General Manager of the Anaheim Ducks from 2005 to 2008. In just over three seasons in Anaheim, Burke guided the Ducks to their first Stanley Cup (2007), first Pacific Division title (2007), and first-two 100+ point seasons (2006-07 & 2007-08). The Ducks also qualified for post-season contention in all three seasons, winning six-of-eight playoff series over that span. Burke received two prestigious honours in the summer of 2008. On June 6, he was chosen by USA Hockey as General Manager of the 2010 U.S. Olympic Hockey Team, and was named a recipient of the 2008 Lester Patrick Award for outstanding service to hockey in the United States on August 7. Burke was ranked No. 1 by The Hockey News in the magazine’s Annual GM Rankings in March of 2008, and was a finalist for The Hockey News “Executive of the Year” in 2006. He was named the Sporting News “Executive of the Year” in 2001, and was a runner-up for the same award following the 2005-06 season. Burke joined the Ducks after a six-year stint (1998-2004) as President and General Manager of the Vancouver Canucks where he revitalized the team and the community en route to consecutive 100+ point seasons and the 2004 Northwest Division title. Under Burke’s leadership, the Canucks improved their point total in four consecutive years from 1999-2003. Since the 2000-01 season, Burke’s teams have qualified for the Stanley Cup playoffs all seven times, playing in 13 total postseason series. In addition, all seven of those clubs recorded at least 90+ points, including four 100-point seasons. Born in Providence, Rhode Island and raised in Edina, Minnesota, Burke was named the Vice President and Director of Hockey Operations by the Vancouver Canucks in June of 1987. Burke left Vancouver to serve as General Manager of the Hartford Whalers for one season in 1992, before joining the NHL front office as Senior Vice President and Director of Hockey Operations in September of 1993. Some of his duties with the NHL included acting as chief disciplinarian by ruling on violations for on-ice player conduct, and working closely with Commissioner Gary Bettman on league direction and collective bargaining matters. After earning his Bachelor of Arts in History from Providence College in 1977, Burke signed with the Philadelphia Flyers prior to the 1977-78 season and won a Calder Cup Championship with the Flyers’ American Hockey League affiliate the Maine Mariners. He then returned to school and graduated from Harvard Law in 1981. Burke practiced law in Boston for the next six years, representing professional hockey players until joining the Canucks in 1987. Brian resides with his wife Jennifer and has six children: Katie, Patrick, Brendan, Molly, Mairin and Gracie.